Crafted identity design, packaging and collateral for Air Jordan, ACG, Cycling and Sport Casual. Art directed photographers, illustrators, filmmakers and designers on fashion and sport collateral. Created award-winning designs, participated in strategic marketing and planning for global brand launches and interacted with senior management, agency and vendors. Directed cross-functional creative teams on album cover designs, logos, tour posters, print advertising, retail merchandising, swag, websites and video projects. Managed schedules, budgets and deliverables in a fast-paced, egocentric business. Collaborated with attorneys, artists, artist management, A&R, marketing and promotions departments. 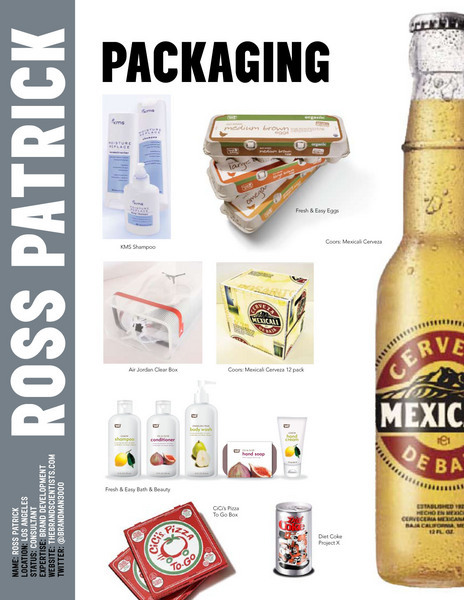 Created all consumer and trade print advertising for label. Managed elite team of art directors, designers, writers, web programmers, and industrial designers to create engaging brand development and product packaging. 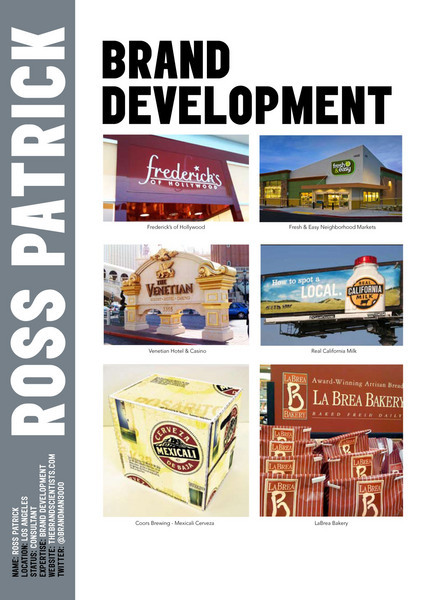 Launched La Brea Bakery, Ketel One Vodka webTV, DIRECTV, KMS and SONY Playstation — working closely with product development teams and marketing to build solid strategic solutions. Lead the Los Angeles based global design group, responsible for all brand touch points including retail, digital, packaging, advertising and all communications. New product launch identity & packaging for: CBTL, Ready Coffee, Ice Blended and Custom Bar. Utilizing retail, packaging, web and social media to build community around the brand. Developing web and social media communications. 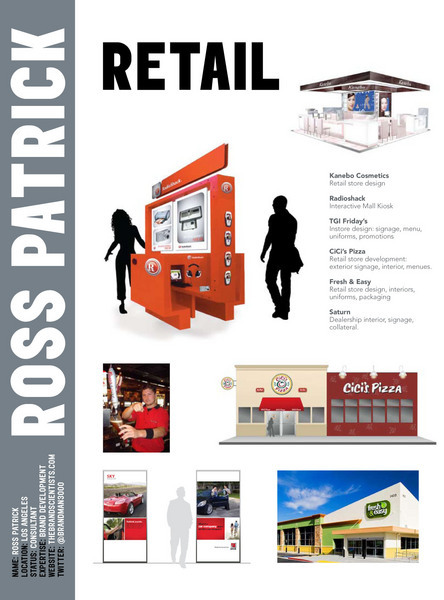 Creating external communications for new store/new market launches: including print, radio, TV, web and event materials. Integrated branding and communications firm, helmed by leading marketing experts who specialize in brand launches and rejuvenations. 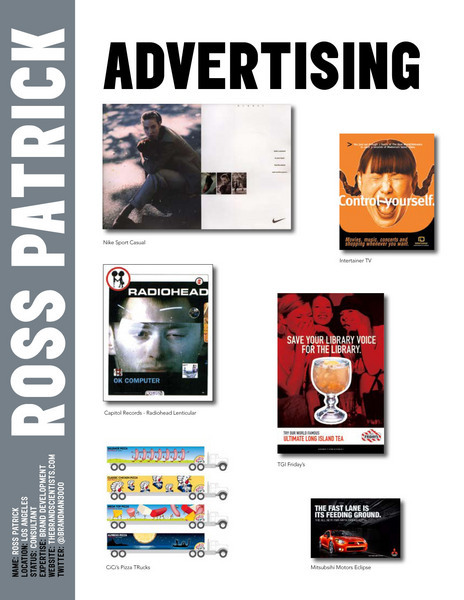 Expertise in retail and digital brand integration, branded content development and social media. 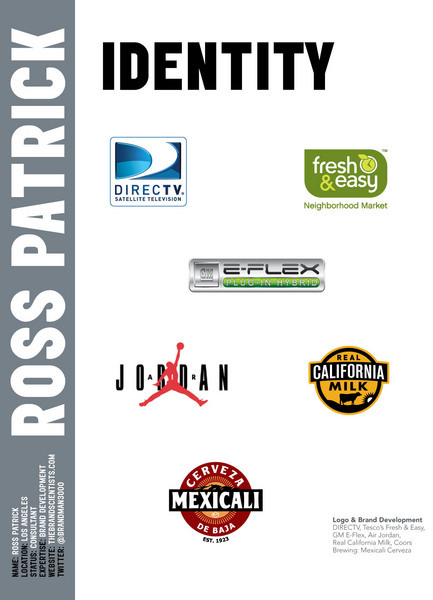 Currently working with Nike Air Jordan, Southern California Edison, DYMO Endicia, Coffee Bean & Tea Leaf and DIRECTV. Rebranded Nike’s Air Jordan — including identity, product, retail, packaging, branding, advertising, and website design. Created print, retail, direct and online campaigns for DIRECTV's retail marketing group, promoting sporting events and special offers that were directly responsible for exceeding customer growth targets. Developed branding and retail communications for Coffee Bean & Tea Leaf. Created new in-store marketing concepts for Applebee’s Restaurants incorporating Twitter and Facebook into the local networking for each restaurant. Built world-class creative team for award-winning, integrated marketing and communications firm, recognized as “Agency of the Year” 5 consecutive years. Orchestrated brand vision and integration for global blue-chip clients across all media touch-points. Oversaw creation and execution of industry-impacting brand development including identity, packaging, advertising, interactive, retail and collateral. Directed brand development and created and maintained brand guidelines for TGI Friday’s, California Cheese, DIRECTV and Tesco’s Fresh & Easy. Launched Tesco's Fresh & Easy Neighborhood Markets including brand identity, retail, packaging, and online. Instrumental in driving billings from $300M to $900M in 6 years. Hired and managed a diverse staff of over 25 creatives. I worked with Eric for 6 years, guiding design teams on Saturn, DIRECTV, Fresh & Easy and TGI Fridays. I also led the Old Navy creative account for print and broadcast. My team of 25 + creatives were responsible for many new business wins. 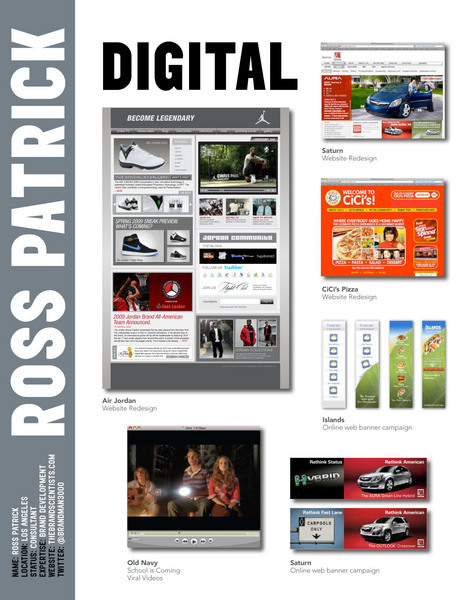 Our integrated efforts created linkage between TV, print, retail, web and direct. We worked with Mark and his team on the Jordan brand refresh. It's a top to bottom effort that will utilize new logo and brand components to redress the retail landscape and create renewed interest in the performance driven brand. The rebrand will set Jordan up for a major push into China in 2011. Mike's the kind of guy you want by your side in a client presentation. I was lucky enough to work behind the scenes with Mike as well as on the front lines. 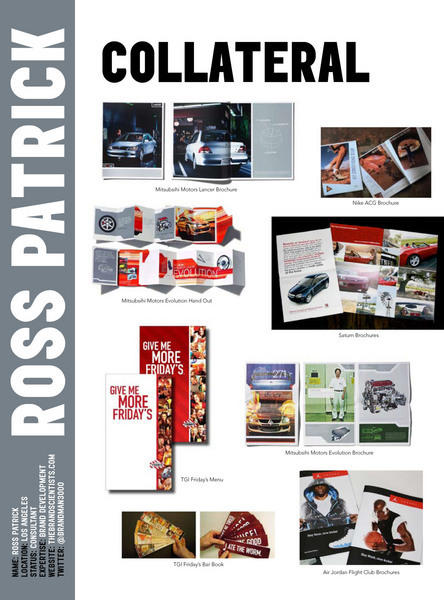 Ross is a highly inventive and strategic creative guru with strong business management and leadership qualities that will drive business value for clients. His finely tuned design sensibilities have crafted integrated brand storytelling for leading global organizations. He has a proven ability to attract and retain world-class talent. Music, Art, and Fashion. Snow, Skate and Surf. Branding, Corporate Identity, Creative Direction, Design, Design Management, Event Design, Illustration, Marketing, Product Development, Project Management, Strategy & Planning, Brand Guidelines, Brand Management, Photo Art Direction, Retail Branding, Interactive, Packaging Design, Design Systems, Brand Launches, Brand Rejuvenation, Digital Marketing, Mobile, Web Strategy, eCommerce, Apps.